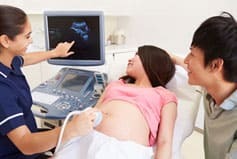 Diagnostic Medical Sonographer uses high frequency sound waves (ultrasound) to produce a dynamic visual image of internal organs, tissues, or blood flow inside the body. Student will be educated on the necessary technical skills to perform abdominal, obstetrical and gynecological, and vascular sonography procedures. The Diagnostic Medical Sonography program requires students to complete 800 clinical hour prior to graduation. AIHT Education has clinical affiliations with numerous healthcare facilities throughout Connecticut and the surrounding area. Students are not permitted to begin the internship until all required classroom and lab hours are completed. 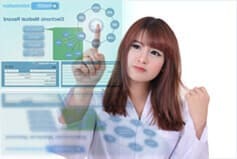 Students will learn job related situations and how to handle these situations while working under the supervision of a trained professional in the field. Students must record all exams that they have observed and/or performed on a daily exam log sheet. Throughout the externship clinical preceptor will evaluate the student monthly based on clinical evaluation criteria. After completion of the graduation requirements, students may appear for American Registry for Diagnostic Medical Sonography (ARDMS) registry exam. The first part of the exam would be to take the Sonography Principles & Instrumentation (SPI) examination which tests basic physical principles and instrumentation knowledge essential to sonography professionals and students. Most student take this exam once they pass the Ultrasound Physic class. To earn a Register Diagnostic Medical Sonography (RDMS) credential, students must pass the SPI examination and a corresponding specialty examination within five years. ARDMS certification shows fellow healthcare professionals, employers and the medical facilities you work with that you work towards achieving excellence in the field of Sonography. In compliance with 34 CFR 668.6(b), the link below provides program disclosure information including tuition and fees, placement rates, completion rates, and other important information for the Diagnostic Medical Sonography program at American Institute of Healthcare and Technology.